Buying a horse is a complicated business at the best of times. When you are looking at buying one for a child it becomes a lot harder. It can be an unpredictable business over how the horse and child react to each other and therefore with a child more than anyone, it is imperative that you make the right choice. You must establish that the child is committed to having a horse before you start to make enquiries about buying one. After all, what child hasn’t asked for a horse at some point in their lives? You must ensure your child is fully committed to having a horse and all that it entails and is not going to get bored with it after a few weeks. The best way to establish this is to get lessons for them and see if they enjoy it. If they do, then get them to look after the horse they are borrowing and see if they can cope with it. It may seem like a lovely idea to buy a young horse for a child. They can grow up together and mature together. But in truth it is a very bad idea. First and foremost, it is not safe. 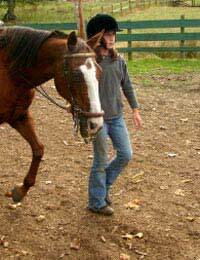 Young horses are apt to startle easily or misbehave. They are not usually a good match for young and inexperienced riders who do not know how to handle any horse, least of all one which has hardly ever been ridden. The best type to try is an older, more mature horse. This type of horse knows how to handle itself and it will have seen the world – the horse will know more than its young rider. The child will be much safer on an older horse and, what’s more, the horse will help to instil them with confidence and help them to become a better rider. An older horse will also forgive a child their mistakes whereas a younger horse will not know how to cope with them, souring the relationship. Ponies are usually chosen for children because of their size. Ponies are generally classed as a horse which is between 10 hands and around 14 hands tall. Children manage a smaller horse better and it is also less far for them to fall when they do have their inevitable first tumble. In addition, a horse which is too big for its rider can be uncomfortable and make riding a very unpleasant experience for the child. When looking for a horse, take the child along and let them sit on each one you are considering and try to see which one feels the best. The ideal horse for a child will be of a safe and gentle disposition. You will need a horse who does not exhibit any bad behaviour or habits, as a child will not be able to break him of these. Not only this, but a horse which has bad habits or makes mistakes can actually be made worse by a child. The perfect horse for a child will be placid, so that a child’s mistakes can be forgotten and no grudge will be held as it may be with a stronger willed horse. There are many things to consider when buying a horse for a child. It is best not to take the child along the first time you view a prospective purchase as you do not want them to fall in love with them on sight. If the horse turns out to be unsuitable you may have a battle on your hands if they have already made them their own in their mind’s eye. But before you part with any money, do make sure the child and horse have met and are happy with each other, and you will hopefully have the beginning of a beautiful friendship. I may purchase a horse/pony in the near future,where will I keep it,cost of purchase,board and feed? I really like these horses BUT how much is it to buy or rent one.